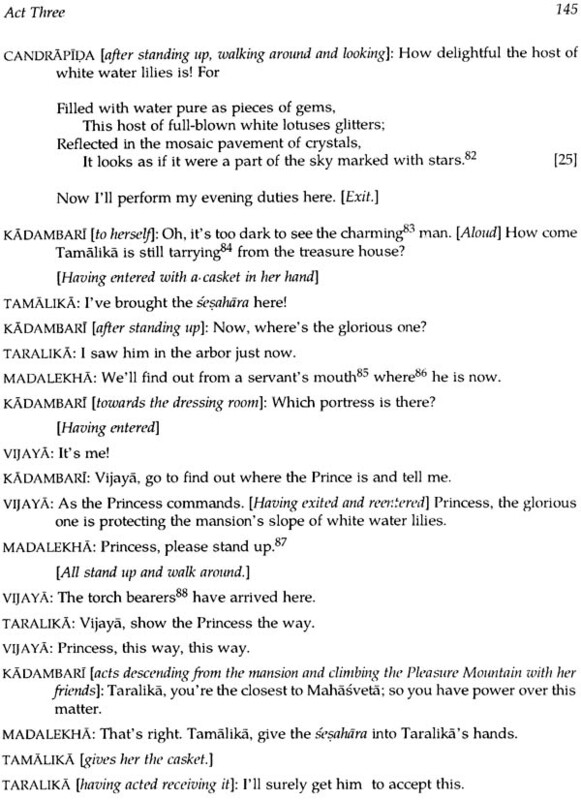 It is the first ever English translation of Narasimha’s Kadambarinataka. 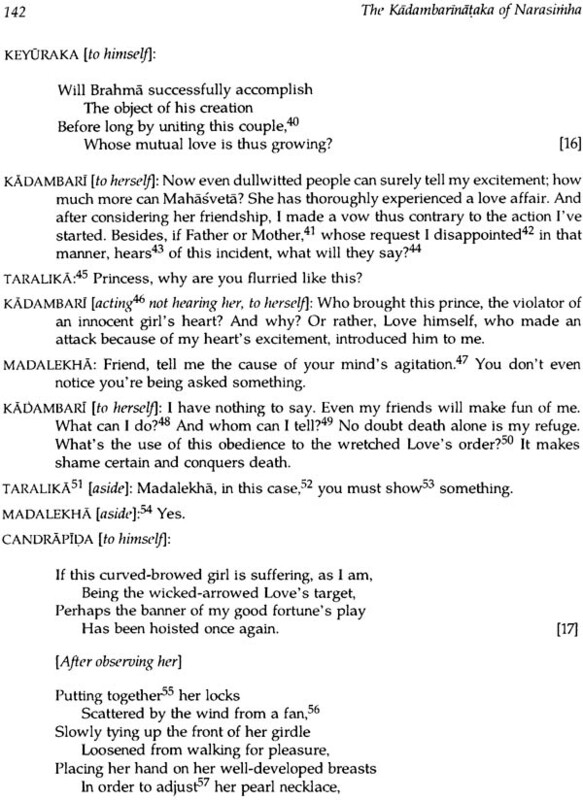 And also its first critical evaluation, highlighting not only its high importance in Sanskrit-Prakrit literature of medieval India, but also how this 14th-century play compares favourably with the masterly kavyas of the classicists like Sudraka, Kalidasa, Bhavabhuti and Rajasekhara. 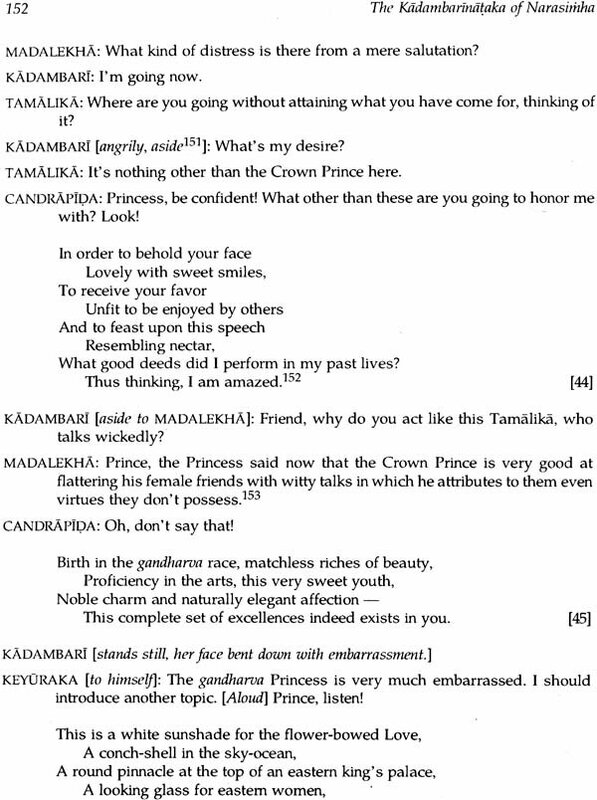 Kadambarinataka is essentially a dramatic version of Kadambari: an internationally celebrated novel/romance of the 7th century, authored by the legendary Bana and his son. 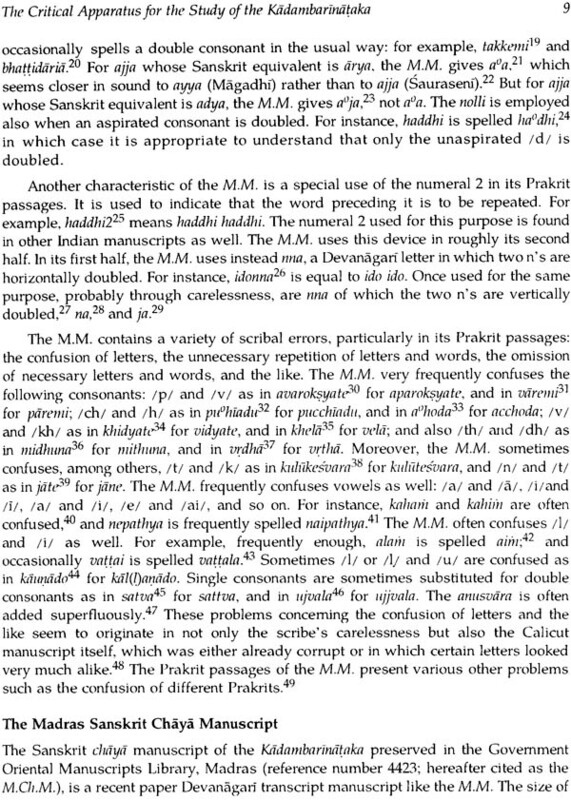 For over six centuries, it has remained unacknow-ledged and unnoticed owing to the prevailing prejudice against the whole range of Sanskrit-Prakrit literature that came to be written after the 10th century or so. Though the play saw its only printed edition in 1936, it was not studied in perspective nor has it so far been translated into any language. Dr. Hideaki Sato retrieves Kadambarinataka from the centuries of oblivion, offering this literary masterpiece, in two parts, to English-knowing audiences the world over. Part One, in the nature of a critical introduction, focuses on Narasimha: the author, his times and his writings; together with insightful analyses of his nataka’s sources, plot structure, language, style, innovative elements and how far it has deviated from Bana’s Kadambari. 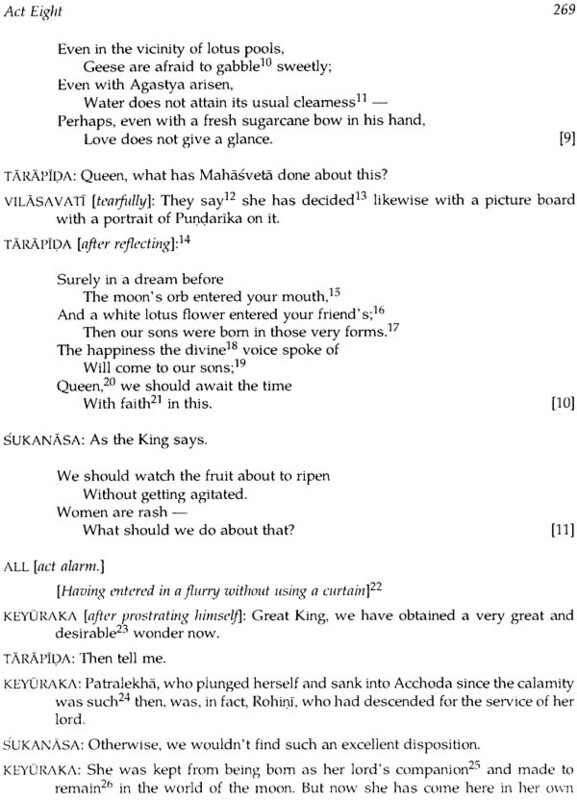 Part Two comprises the English rendering of Kadambarinataka which, based directly on its two manuscripts available today, also carries extensive textural notes. Hideaki Sato is a Japanese scholar of Sanskrit literature, with strong interests in Eastern religions and philosophies. A landed immigrant in Canada since 1984, he took both his M.A. and Ph.D. in Sanskrit literature from the University of Toronto - where, now associated with its Centre for South Asian Studies, he is a postdoctoral research fellow. He is also Member of American Oriental Society; Canadian Association for Asian Studies; and a few other similar bodies. Dr. Sato knows over a dozen languages, is recipient of several scholarships/fellowships, has traveled across the continents. He has published research articles/papers and books, and has taught Japanese at different institutions, in Canada and India, for the last fifteen years or so. Narasimha’s only known play is a brilliant rearrangement of Bana’s unfinished novel Kadambari with his son Bhusana’s completion. The matter is kept intact in almost every essential, but cutting out long descriptions and narrative and substituting action. In the successive acts this rises through a series of dramatic crises. The opening finds Candrapida already hunting in the northern mountains and carried by his horse to Mahasveta (who will introduce him to Kadambari), which comes near the middle of the original narrative. 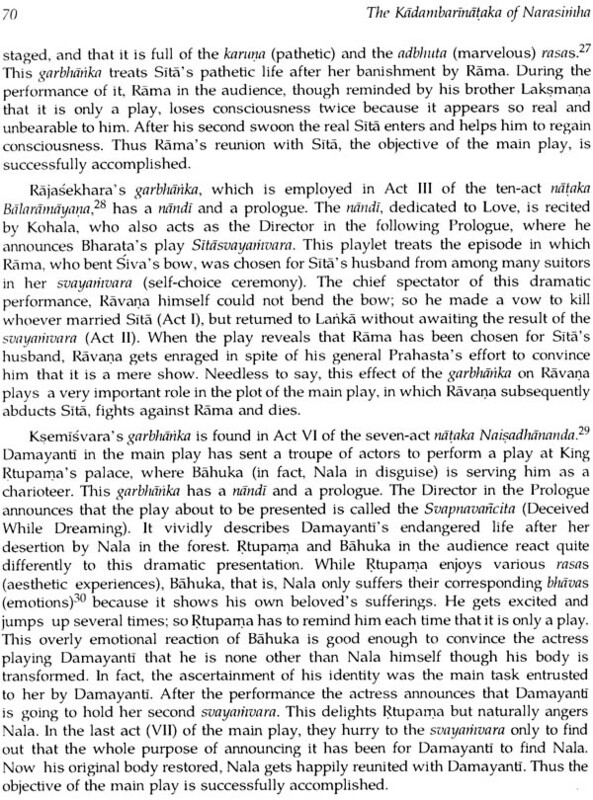 Mahasveta’s history is moved from there to Act V, where Narasimha has kinnara actors show it as a play within the play to Vaisampayana, her lover Pundarika transformed but thus reminded of his past. 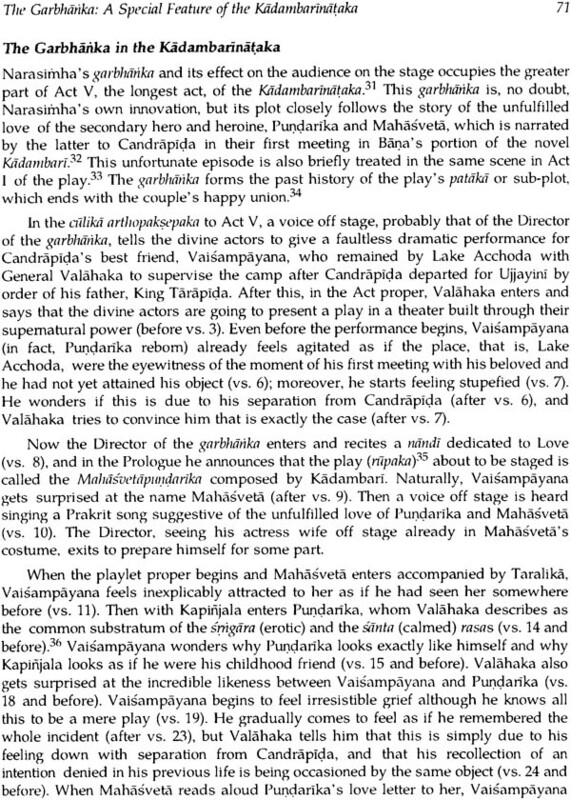 This resolution of the sub-plot has disastrous immediate consequences for Vaisampayana, but brings Candrapida back from his father to the mountains, thus renewing the main action. Yet as Kadambari arrives to meet him, Candrapida is struck lifeless by Mahasveta’s curse instigated by Vaisampayana’s impetuous behaviour. This is the obstacle conjunction. Narasimha has here altered a detail in Bhusana, who has Candrapida’s heart fail on hearing what had happened to Vaisampayana. This change is surely an improvement, since hearing what had happened to Vaisampayana. 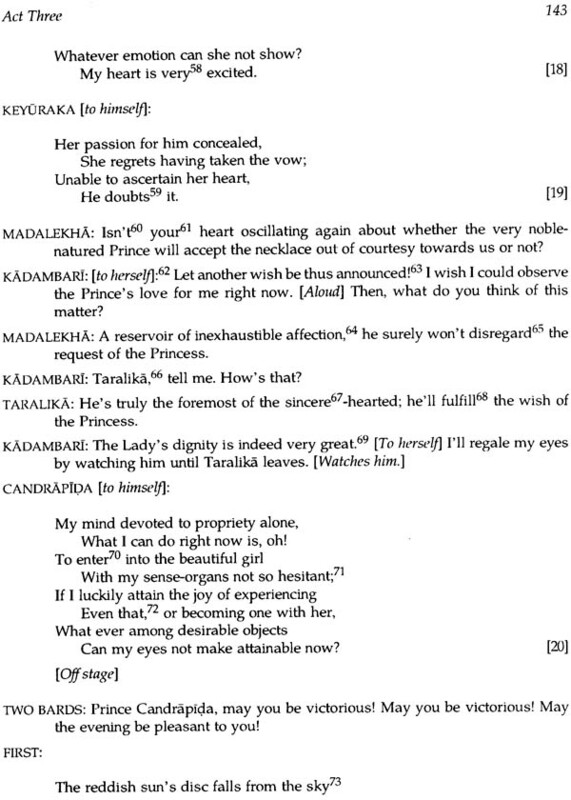 This change is surely an improvement, since hearts in this story do not fail even when seeing a lover apparently dead. 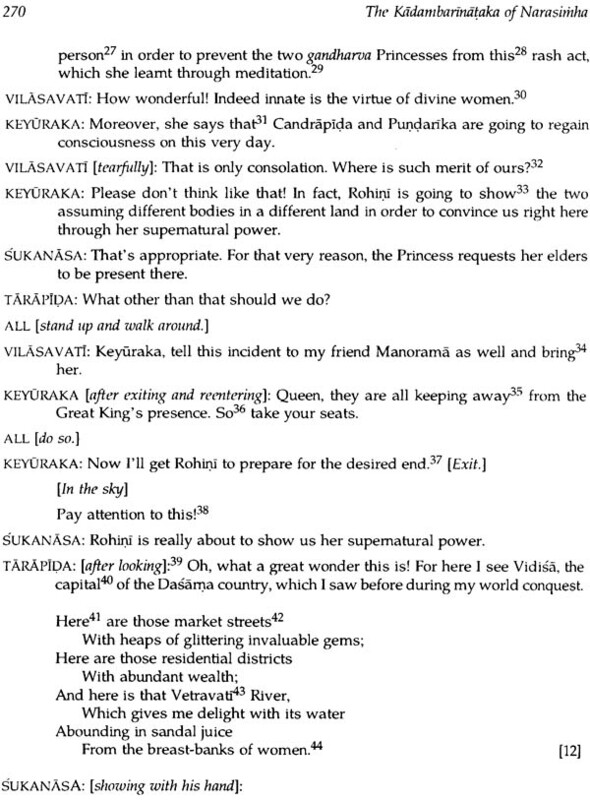 In the final act (VIII) Narasimha has what is almost another play within the play when Rohini by her divine power shows Candrapida living as Sudraka listening to the parrot Vaisampayana at the very beginning of the original novel. The parrot’s revelation brings about their restoration and the conclusion of the action. Dr. Sato in his Introduction has commented on several smaller changes by Narasimha which reinforce the action or modify the characterization, making Candrapida bolder as a lover than Bina’s cool and hesitant hero. This may make the play easier for an audience, but it spoils Bana’s psychological study of a different young lover, contrasting with his impulsive and undisciplined Pundarika. 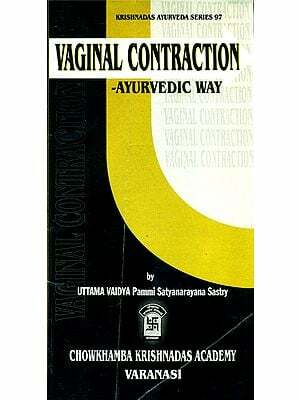 Dr. Sato’s translation is unusually straightforward and natural. It reads easily but brings out all the details of meaning without substituting simplified or vaguely ‘equivalent’ ideas. The notes supply a new, critical text of the play, with corrections, restoration of omitted passages and elimination of unnecessary insertions. V. Krishnamacharya was a heroic editor, given the materials available, but he was not critical, does not let the reader see what he did or what readings were in the manuscripts. Now we have a full critical apparatus and a greatly improved text, which is here translated. This excellent play shows the theatre tradition of India flourishing in the south (Andhra) in the 14th century, when the north, ravaged by fanatics, lay in ruins, its literature in ashes. It gives the lie to the widespread prejudice that Indian culture was ‘decadent’ in the middle ages, the implication that conquerors were invited. But nothing is harder to eradicate than a prejudice rooted in many time-worn secondary and tertiary ‘sources’. Here is an authentic and lively drama to exorcise it. 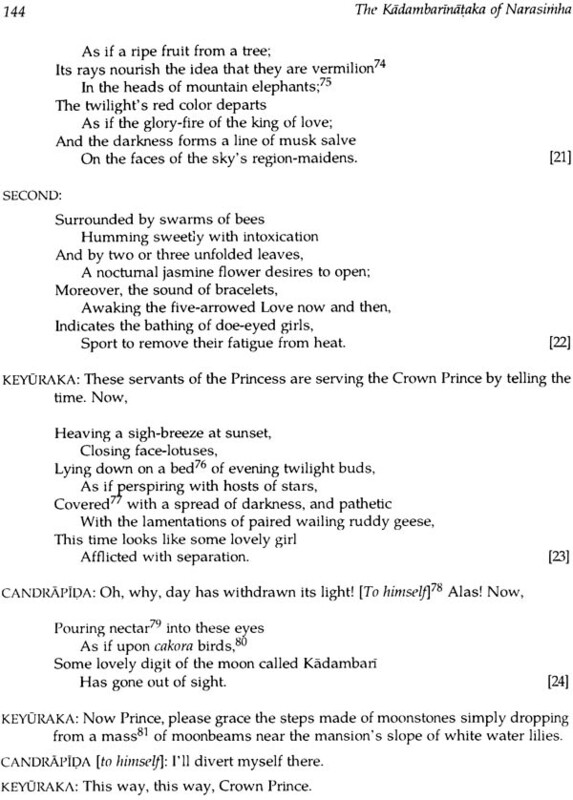 The Kadambarinataka by the fourteenth-century Andhra playwright Narasimha is an eight-act Sanskrit-Prakrti dramatic version of the very well-known Sanskrit novel Kadambari by Bana and his son Bhusana in the seventh century. 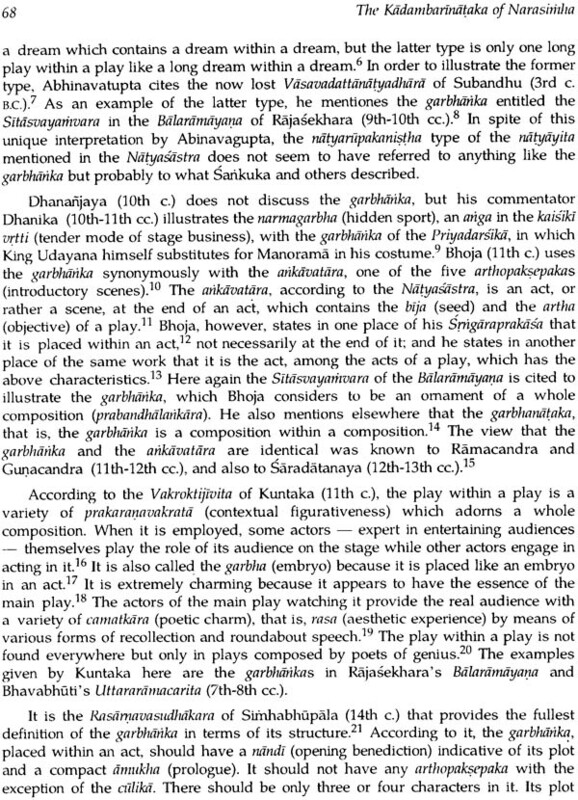 Among the numerous innovations Narasimha introduces into the Kadambarinataka is the garbhanka, or the play within a play, in Act V, whose primary purpose is to remind its main spectator, Vaisampayana, of his former life as Pundarika and his unfulfilled love for Mahasveta. Narasimha is a maternal nephew of the renowned poet Agastyapandita, the author of the Krsnacarita, the Nalakirtikaumudi and other works. 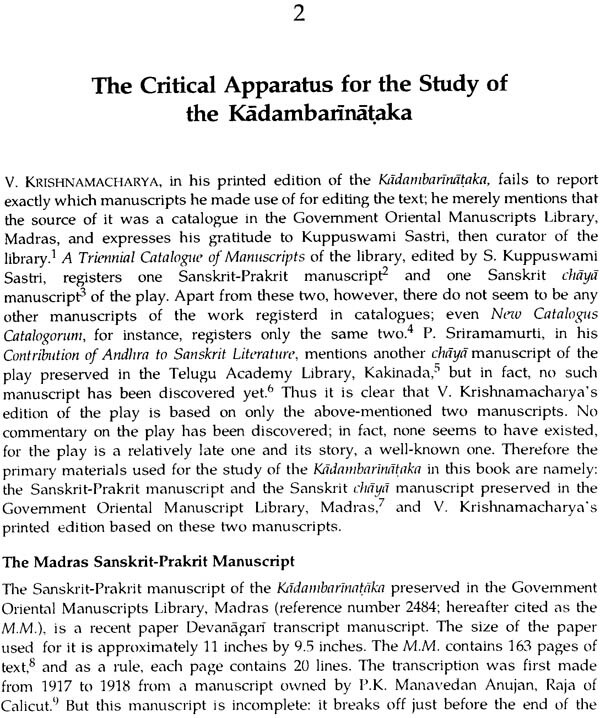 Though the Kadambarinataka is obviously an excellent work, it has not yet received any appropriate treatment from scholars sine the only printed edition of it was published in 1936. It has never been thoroughly studied or translated into any modern language. 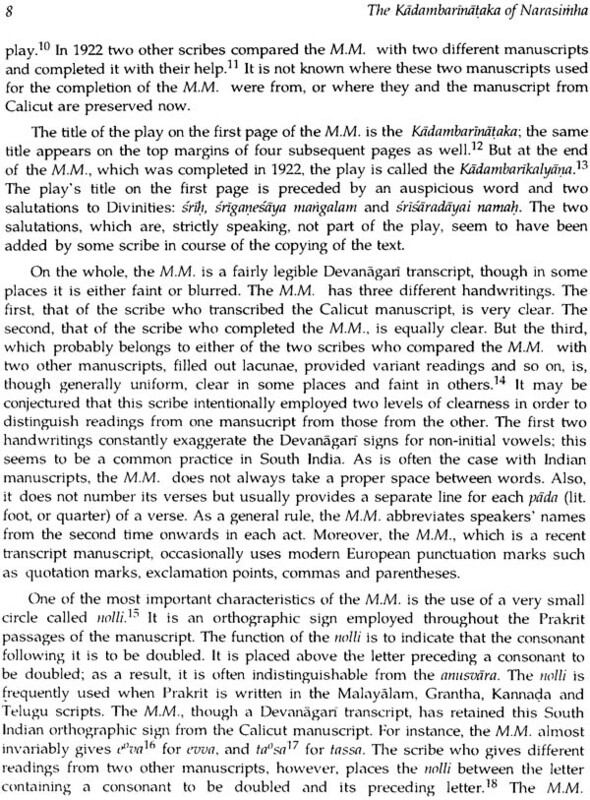 This long neglect of the study of the play seems to be at least in part due to the popular theory that the Sanskrit-Prakrit dramatic literature after the tenth century or so is decadent, therefore unworthy of any special attention. The present researcher, however, has decided to undertake the task of introducing the Kadambarinataka to the world because he believes it is high time this fine kavya work was properly treated by a specialist unbiased towards later Sanskrit-Prakrti plays. This book consists of two parts. 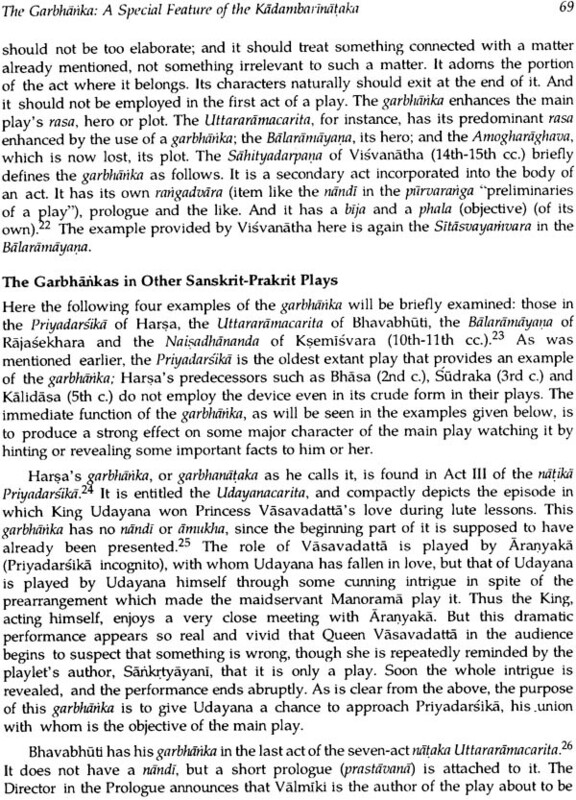 Part one is an introduction to the Kadambarinataka: it carefully examines the play in the light of its source story, that is, the novel Kadambari; other Sanskrit-Prakrit plays; the Natyasastra of Bharata and several later theoretical works on classical Indian dramaturgy and poetics, and the like. 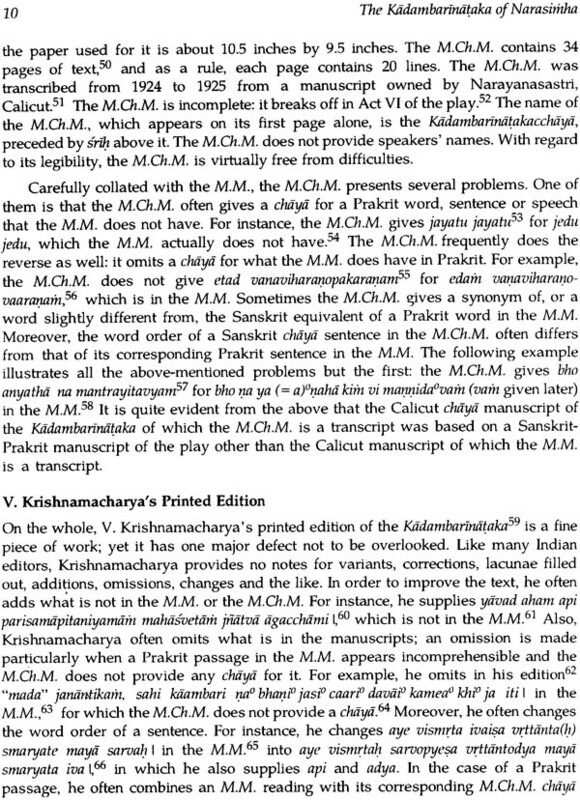 Part two provides the first and complete English translation of the Kadambarintaka made directly from the only manuscripts of it now available, on which the printed edition of it is based, with detailed textual notes. This book is a revised version of the researcher’s doctoral dissertation, for which he was awarded the degree by the University of Toronto, Canada in 1991. The researcher must here express his gratitude to those who have helped him to accomplish this task. His deepest gratitude is due to is dissertation supervisor, Prof. A.K. Warder, who has always been the greatest inspiration for his studies. The researcher is also indebted to Dr. K.K. Raja and Mrs. R. Burnier in the Adyar Library and Research Centre, Madras; Mr. C.N. Ramesh in the Government Oriental Manuscripts Library, Madras; and Mr. S. Dasarathi in the Telugu Academy Library, Kakinada, who all assisted him on his visits to their institutions. He is also grateful to Prof. P. Sriramamurti in Andhra University, Waltair, who kindly provided him with some information by correspondence, and to Mr. G. Venu and his troupe in Irinjalakuda, Kerala, who delighted him with a Kutiyattam performance during his stay there. His gratitude is also due to Prof. N.K. Wagle in the University of Toronto and Prof. L. Rocher in the University of Pennsylvania for their constant encouragement and advice. Last but not least, his thanks are due to his family, friends and many others.